Alexandria Ocasio-Cortez isn’t old enough to run for president. But the freshman congresswoman from New York introduced a Green New Deal resolution on Thursday that is already emerging as a key policy test for 2020 Democratic candidates. 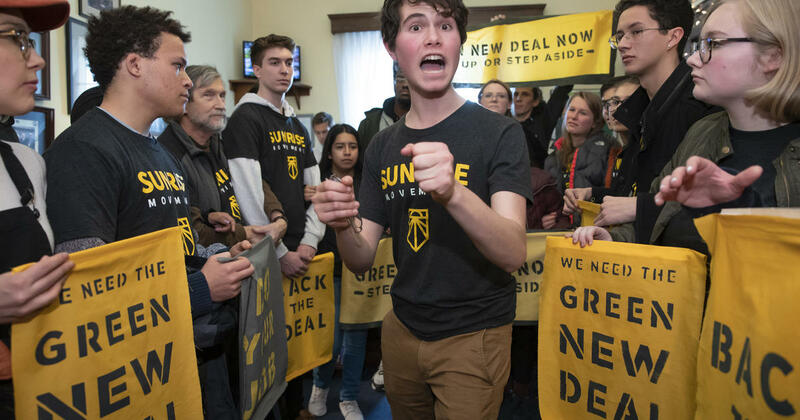 Progressive activists are “extremely supportive of the Green New Deal and think of it as the gold standard plan on climate, and expect their presidential candidates to be treating it as such,” said Chad Bolt, associate policy director of Indivisible, a grassroots resistance group. Bolt says the environment ranks among the top three issues for its members. The resolution introduced by Ocasio-Cortez and Massachusetts Sen. Ed Markey, a Democrat, is broad and light on specifics, and seen more as a roadmap for overhauling the economy than a concrete piece of legislation. The resolution includes plans to decarbonize the economy, reduce greenhouse gases, make sure low-income and minority communities benefit, create a federal jobs guarantee, provide universal health care, and make investments in infrastructure. The Green New Deal proposal is named after President Franklin Roosevelt’s sweeping “New Deal” economic and labor reforms during the Great Depression. It’s aimed a transforming the American economy by ending its dependence on fossil fuels, investing heavily in renewable energy like solar and wind and sparking large-scale job-creation. Some proposals have set the goal to converting the entire U.S. economy to renewable energy within 12 years and eliminating the carbon footprint by 2030. The lack of specifics could present opportunities and liabilities for presidential candidates. On one hand, it becomes a kind of “catch-all” way to talk about the environment, jobs and economic fairness, issues at the forefront of the party’s primary. But on the other, it could put candidates in a difficult position when pressed on the costs and impact on certain jobs and industries. The debate over Medicare-for-All has already shown the kinds of risks and rewards candidates face. Later in the morning, Pelosi said she had not seen the proposal. “I do know its enthusiastic and I welcome all the enthusiasm that is out there,” she told reporters during her weekly press conference. Pelosi also named the nine Democratic members of the new Select Committee on the Climate Crisis — and notably left Ocasio-Cortez off the list. But the base of the party sees the proposal as a way for its leaders to capitalize on its new power in Washington. Most of the Democratic presidential candidates, including Senators Kirsten Gillibrand of New York; Kamala Harris of California; Elizabeth Warren of Massachusetts; and Cory Booker of New Jersey have also broadly endorsed the idea behind the Green New Deal. Oregon Democratic Sen. Jeff Merkley, who’s mulling a presidential bid, said the issue should be an integral part of his party’s agenda going forward. On CBSN’s “Red and Blue,” Merkley outlined what he believes should be the key components of a comprehensive Green New Deal.